Candidates voice their commitment to transparency after prior alderman indictments. Anthony Driver at the 20th Ward Alderman forum. 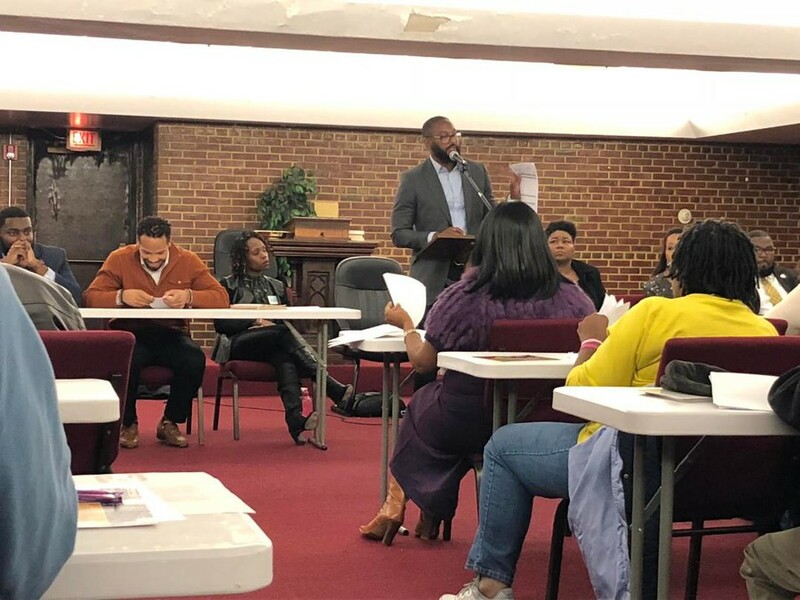 Ten candidates vying to replace indicted 20th Ward Alderman Willie Cochran gathered at the Antioch Baptist Church in Englewood to discuss their platforms last week. In December 2016, Cochran was charged with taking bribes and using 20th Ward money for personal expenses. After Cochran announced his withdrawal from the race for reelection in August, more than 10 candidates quickly jumped in, making it one of the most competitive aldermanic races in Chicago. At the forum, candidates were divided over policy surrounding the incoming Obama Presidential Center (OPC), but they converged on the policy areas they most prioritized—public safety, education, and economic development. They also agreed that building trust in the community was of importance, especially since two of the past three aldermen in the 20th Ward have been indicted. When asked by a member of the audience if they would pass the Community Benefits Agreement (CBA) ordinance for the OPC, the majority of the candidates replied with a “yes,” but two candidates said “no.” Kevin Bailey, a member of the 20th Ward Democratic Organization and a former engineer on Obama’s high speed rail project, and Maya Hodari, a project manager for Chicago Housing Authority, said they are not willing to commit to passing a CBA ordinance without first having time to review its contents. Bailey and Hodari were not given time to elaborate. Multiple candidates went on to explain how they would put checks on themselves should they hold the aldermanic office. Denard Newell, a businessman, Cassius Rudolph, an ordained minister and nonprofit leader, and Clifton Pierce, owner of multiple nightclubs, all cited having alternative occupations as a reason for independence from the alderman salary. In fact, Driver said he would propose to lower the salaries of aldermen in order to reduce the incentive for people to remain in office for excessively long periods of time. These forums will continue to be held until candidate names are placed on the ballot on November 26, 2018. The next forum will take place in the Back of the Yards neighborhood of the 20th Ward. Charlie Kolodziej and Jack Cruz-Alvarez contributed reporting.